In the second part of this month’s water potential series (see part 1), we discuss the separate components of a water potential measurement. The total water potential is the sum of four components: matric potential, osmotic potential, gravitational potential, and pressure potential. Below is a description of each component. Matric potential arises because water is attracted to most surfaces through hydrogen bonding and van der Waals forces. This water droplet is pure but no longer free. The matric forces that bind it to the plastic have lowered its potential and you would have to use some energy to remove it from the surface and take it to a pool of pure, free water. Soil is made up of small particles, providing lots of surfaces that will bind water. This binding is highly dependent on soil type. For example, sandy soil has large particles which provide less surface binding sites, while a silt loam has smaller particles and more surface binding sites. 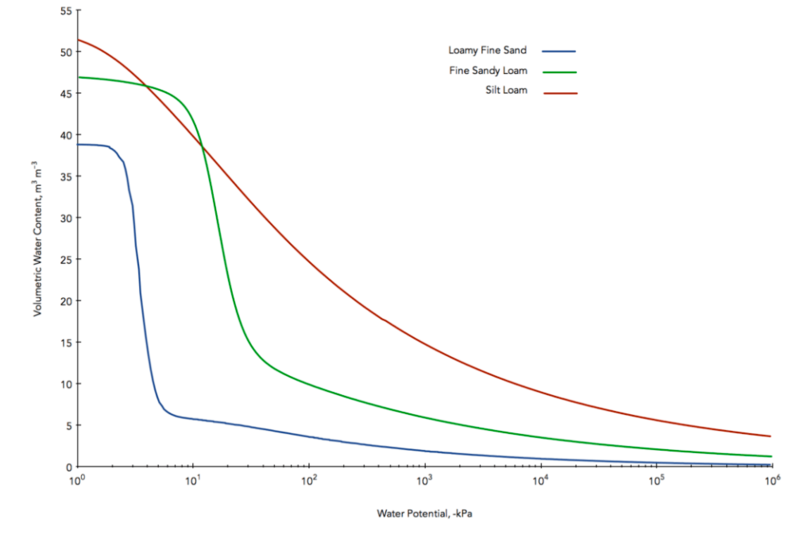 The following figure showing moisture release curves for three different types of soil demonstrates the effect of surface area. Sand containing 10% water has a high matric potential, and the water is readily available to organisms and plants. Silt loam containing 10% water will have a much lower matric potential, and the water will be significantly less available. Matric potential is always negative or zero, and is the most significant component of soil water potential in unsaturated conditions. Osmotic potential describes the dilution and binding of water by solutes that are dissolved in the water. This potential is also always negative. Osmotic potential only affects the system if there is a semi-permeable barrier that blocks the passage of solutes. This is actually quite common in nature. For example, plant roots allow water to pass but block most solutes. Cell membranes also form a semi-permeable barrier. A less obvious example is the air-water interface, where water can pass into air in the vapor phase, but salts are left behind. You can calculate osmotic potential from the following equation if you know the concentration of solute in the water. Where C is the concentration of solute (mol/kg), ɸ is the osmotic coefficient (-0.9 to 1 for most solutes), v is the number of ions per mol (NaCl = 2, CaCl2 = 3, sucrose = 1), R is the gas constant, and T is the Kelvin temperature. Osmotic potential is always negative or zero, and is significant in plants and some salt-affected soils. Where G is the gravitational constant (9.8 m s-2) and H is the vertical distance from the reference height to the soil surface (the specified height). 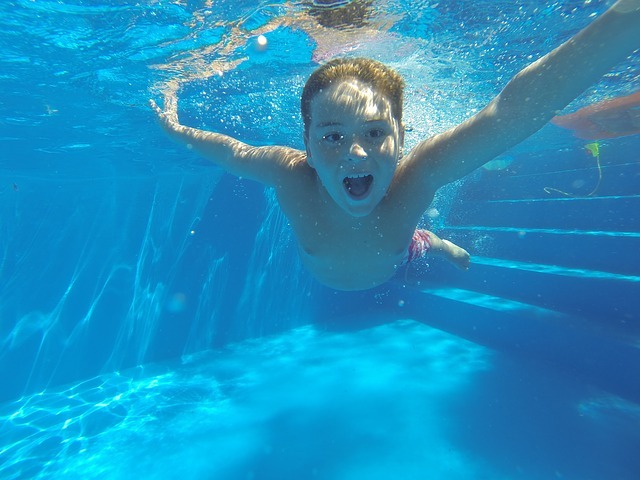 You can feel positive pressure as you swim down into a lake or pool. Pressure potential is a hydrostatic or pneumatic pressure being applied to or pulled on the water. It is a more macroscopic effect acting throughout a larger region of the system. There are several examples of positive pressure potential in the natural environment. For example, there is a positive pressure present below the surface of any groundwater. You can feel this pressure yourself as you swim down into a lake or pool. Similarly, a pressure head or positive pressure potential develops as you move below the water table. Turgor pressure in plants and blood pressure in animals are two more examples of positive pressure potential. Where P is the pressure (Pa) and P_W is the density of water. Though pressure potential is usually positive, there are important cases where it is not. One is found in plants, where a negative pressure potential in the xylem draws water from the soil up through the roots and into the leaves. Next Week: Learn the different methods for measuring water potential and their strengths and limitations.